Email marketing automation is a game changer for e-commerce. We already know email is one of the most ROI-rich channels for online stores, and if you sent each and every email manually, you would do literally nothing else. However, with email automation, you can send timely, relevant messages that will not only boost this channel’s revenue generation power, but also create a strong relationship with your customers. Welcome emails are an important first contact between your brand and the customer. They’ve trusted you enough to give you their email address, so it’s best to make a great first impression. According to a survey by BlueHornet, 74 percent of customers expect a welcome email when they subscribe to your site. If you’ve promised some kind of incentive to sign up, they’ll also get a higher open and click-through rate. 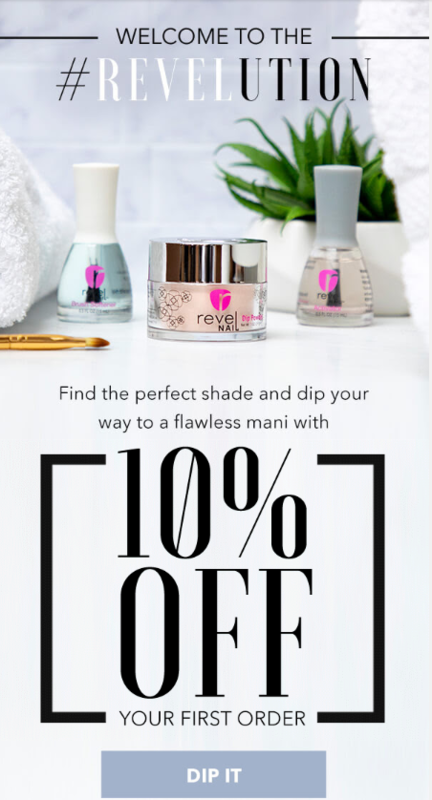 Revel Nails offers 10 percent off your first purchase when you sign up on their mailing list. This is only the first part of their email, but it’s already a great example of a good welcome email. You get a gorgeous photo of their products, plus the incentive offered, and a unique CTA that brings the shopper back to purchase. Using email automation for your welcome series is a great idea because your email can be sent out immediately. You’ll never have to worry about a customer slipping through the cracks. This is your first contact and first impression with your customer. You should offer your discount code (or whatever other incentive you offered upon signup), and introduce who you are. This isn’t to say write a novel about how your company came to be, but rather introduce what you have to offer. Show off your most popular products and always provide a CTA to bring the customer back to your site. The second email is about building your brand. Show your customers what goes into creating your products, give a behind the scenes look, and offer lookbooks or other creative content you’ve built around your products. This email is supposed to reinforce your brand image, and potentially remind your customers to use their discount code, if they haven’t already. In the third email of your welcome series, you want to showcase other customers who are happy with your brand. Display your reviews and social posts from customers on Instagram or other social networks. This helps reinforce trust in your brand, which is key to getting that first sale. This is just one example of how to write a killer email series, and doing so will help onboard your customers properly and set the foundation for your relationship with them. Several studies show 7 of 10 carts never see the light of checkout, and losing 70 percent of your potential income is just part of being an e-commerce owner. Cart abandonment is a huge problem in the e-commerce world, and everyone experiences it. But the way you handle your reaction to that abandoned cart can make all the difference. Most carts are abandoned due to an unexpected cost, like shipping for example. If cost is the only thing standing in your way of 70 percent more sales, a discount can sweeten the deal. Alternatively, a lot of carts are forgotten, gathering dust because we as consumers can’t focus on anything longer than about 30 seconds before we’re distracted by the next notification or idea. A well-timed automated email can be just the thing that brings your customers back to completing their purchase. As with all of the abandoned cart emails you send out, keep a supportive, helpful tone, as opposed to a salesy tone. Include a photo of the product, and remind them why they loved the product in the first place. Notice how the above email has that supportive tone with a touch of humor? Adidas shows the product in a large, lovely photo and then follows up with more gorgeous product photos and reviews from customers who also loved the product. This email should deploy 12 hours after the first email was sent. You should add more support items to this email, like live chat for example. Adding in customer reviews for the product is also a great choice to help build trust and show your customers how others have enjoyed the product. In this third email, you can try adding some urgency to show that their cart might be getting ready to expire, or saying that there are only four items left in the size they want. Adding this urgency can help bring that customer back with the fear of missing out. Note that none of these emails have mentioned a discount. It’s a relatively common practice for customers to abandon carts on purpose to see if you’ll send a discount. If you do send one, wait until the second or third email. Chances are, if a customer thinks they won’t get a discount out of waiting, they’ll come back and purchase anyway. Regardless, you won’t know what really works for you until you test different practices. It shouldn’t come as a surprise that order confirmation has some of the highest open and click-through rates of any other automation workflow. In fact, it beats out every other kind of automation. Customers love to get updates on their order. If they know their order status is waiting in an email with a link to click back and check on that status or tracking, that email will be opened for sure. In fact, I just received a package from ASOS today. As a customer, I must have opened and reopened that confirmation email seven or eight times because I wanted to look at the products again. Because I was excited to see them. Because I wanted to track my packages again. That email has only been in my inbox for two days. I don’t think I’m an atypical customer. Imagine how much more powerful that email might have been if it had some nifty product recommendations to go with the items I purchased. I might have already been checking them out on ASOS as we speak. 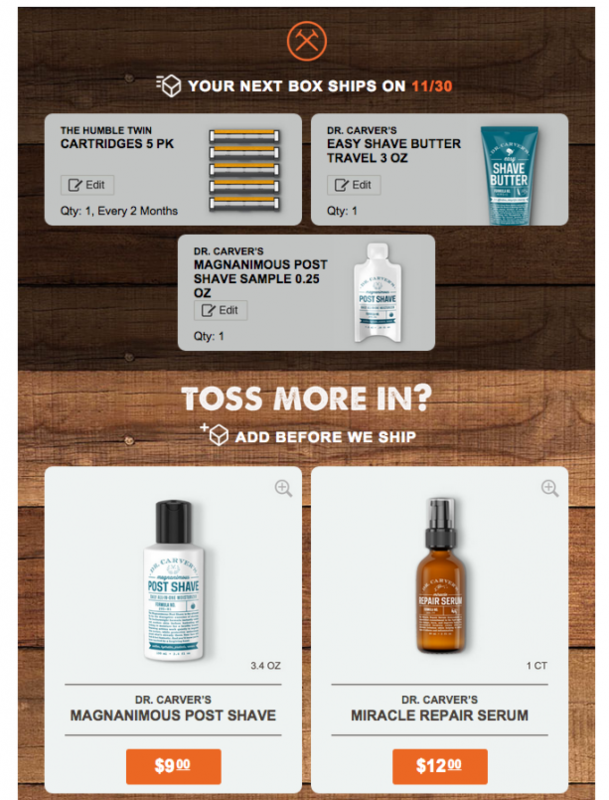 Dollar Shave Club uses shipping notifications to cross sell to their customers. This works particularly well for boosting your average order value, as a customer can justify smaller purchases. If they’ve purchased a subscription, as with the case of Dollar Shave Club, they’ve likely already paid for their box. What’s $9 more for post-shave cream? While purchase rate is lowest for order confirmation emails, it’s important to use this email with a nearly guaranteed open rate as an opportunity. You may not make the sale from the email itself, but you might just bring the customer back enough times to restart their customer journey. 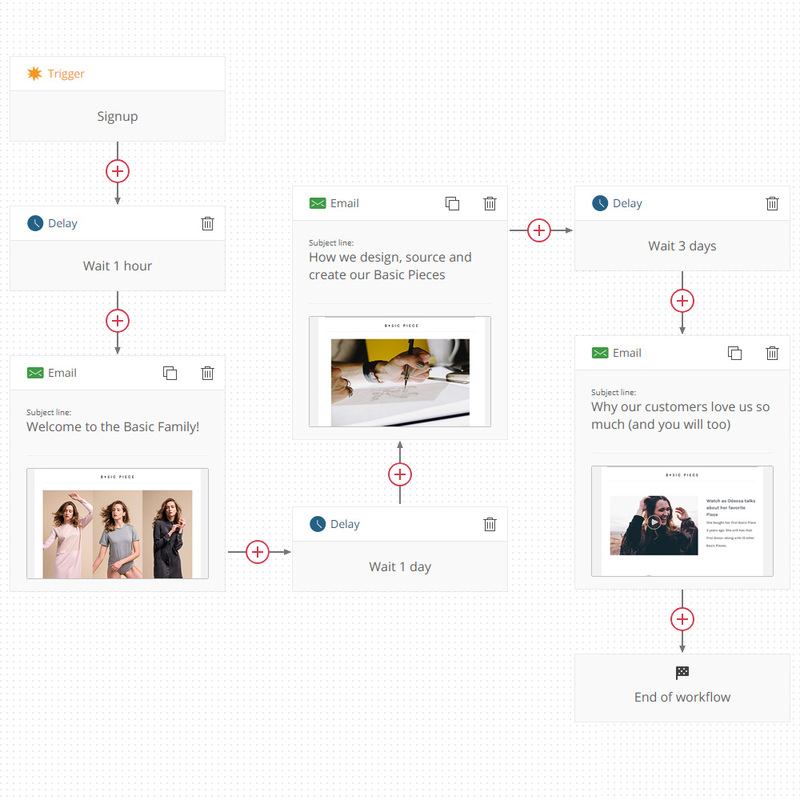 There are loads of other kinds of marketing automation workflows you can set up to recover even more revenue, but these three are your superstars. By correctly introducing your brand and products to your customer in a great welcome series, you’ll lay the foundation for a great relationship. By using a supportive tone in a cart recovery series, you’ll show your customer you are available to help. By sending prompt order and shipping notifications, you build more customer trust. And when you’ve built a great foundation, shown your customer that you’re available and that they can trust you, you’ll be the obvious choice for their shopping needs. Email marketing automation can be an absolute life-saver for e-commerce marketers. By automating these simple messages, you can make sure that your customer never slips through the cracks. Whitney Blankenship is a content marketing manager for Omnisend. When not writing awesome content, Whitney is reading up on the latest in digital marketing, e-commerce and social media trends. Obsessed with pop culture, art, and metal. Powered by coffee. Fastest Googler in the West.